Profit Analysis [AMMIC/NetPA]｜Manufacturing and Cost Management System's Ammic. Make quick and accurate business decisions through our profit analysis module. Strategic decision-making can be done using our profit and loss management functions. Through profit-and-loss management and profit analysis your company can improve its earning capacity by making strategic business decisions. Information such as profit rate in each product/purpose, and profit rate in each sales department/sales person are provided in our system which can be very helpful in decision-making. Function Feature2. Grasp the product inventory amount in the distribution center. Function Feature3. Profit-and-loss management excluding internal profit in the group businesses. Function Feature4. Profit-and-loss management in each sales office. Function Feature5. 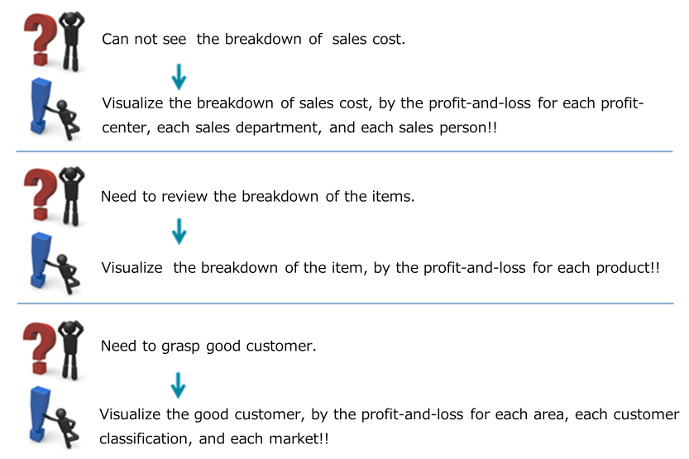 Profit management in each customer mesh. Analysis by the graph using the profit-and-loss templates. Marginal profit ratio such as Sales, sales cost, Gross profit, Selling cost, Sales profit, Sales profit rate, the break‐even point, Fixed and variable cost rate can be grasped in the realtime.